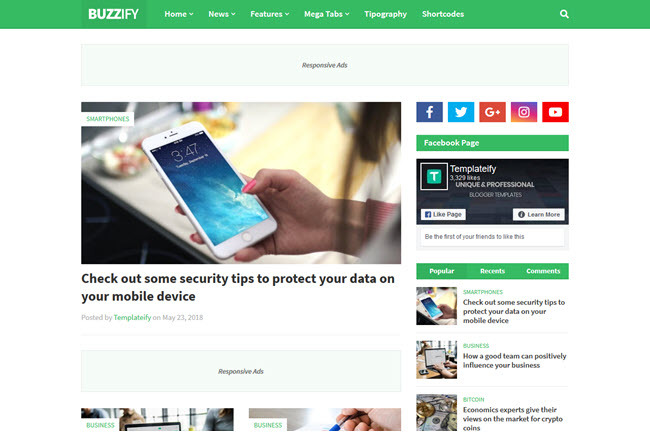 Buzzify is a professional blogger template, its design is unique and fully customizable for you to develop your own design. Buzzify has a number of advanced features and also comes with SEO optimized to provide better search results, improving organic traffic to your blog, as well as sections for ads within posts, so you can increase your earnings. Simple Mega Menu by (Recent or Label). Advanced Mega Menu Tabs by (Label). Post List Widget by (Recent, Label or Comments). Social Icons on Footer Bar. New Blogger Comment Form Style. Google Plus Comment Form by Blogger. Fully Customizable Background and Colors. 12 Months of Premium Support. Detailed Documentation - Check it. Video Tutorial - How to Setup Buzzify Blogger Template. Support for Premium - Contact Us.